In this day and age of pubs closing it can be very disheartening to turn up and find your local has closed for good. But I've actually found something worse. Our local, well run by a good manager and his better half, is still the same pub but with a new manager who doesn't care about his business. Over the last couple of months the Leinster Arms has gone from being a friendly local which catered to tourists as well to being a tourist pub where the site of someone you know is quite rare. The ale has gone from being good to being passable, the staff go through the motions, the manager probably watches more TV than any of his locals ever did, in fact its somewhat like preplanning someone's funeral because even though they haven't gone yet you know they will pass on shortly. R.I.P. 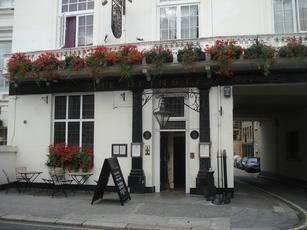 The Leinster Arms, its been nice knowing you. Best pint of my trip around Bayswater Pubs. London Pride in great condition. I have been visiting this pub since 1983, though it may have been called something else then. No memories of that time, other than it was up the road from my flea pit hotel. Nowadays wherever I stay in London I still pop in here at least once each trip, as its got a comfort factor that many pubs fail to match. Friendly bar staff, OK beer, TV here & there if you need it. Food too, though I have never eaten there. I have little idea why I like it so much, other than it fits. Dropped in for a couple of pints with some work mates. Pub was nice, good selection of beer, the Haka was particularly nice! Had a couple of pints on Monday 23/4. Not bad at all. Didn't eat, but food looked good. Friendly staff and good beer. Will certainly visit again.